The New Testament teaches us that--unless exceptions are revealed elsewhere--every Old Testament commandment is binding, even as the standard of justice for all magistrates (Rom. 13:1-4), including every recompense stipulated for civil offenses in the law of Moses (Heb 2:2). From the New Testament alone we learn that we must take as our operating presumption that any Old Testament penal requirement is binding today on all civil magistrates. The presumption can surely be modified by definite, revealed teaching in the Scripture, but in the absence of such qualifications or changes, any Old Testament penal sanction we have in mind would be morally obligatory for civil rulers. Theonomy is application of the law. Greg Bahnsen, No Other Standard (Tyler, TX: Institute for Christian Economics, 1991), p. 68. The principle of interpretation which is supposed to govern Christian orthodoxy is that Christ came to establish, confirm, and declare the Old Testament law (Matt. 5:17-18). Only if we find an explicit abandonment of an Old Testament law in the New Testament, because of the historic fulfillment of the Old Testament shadow, can we legitimately abandon a detail of the Mosaic law. 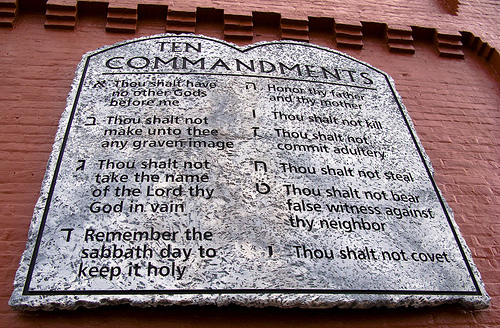 Many have done a reformed critique and those that do seem to go to far as to even deny the importance of keeping the Ten Commandments. The question should really be how much should our government apply of the moral law today and are we commanded to partially or completely reform our laws? The proper exegetical principle is this: Mosaic law is still to be enforced, by the church or the State or both, unless there is a specific injunction to the contrary in the New Testament. Gary North, The Sinai Strategy: Economics and the Ten Commandments (Tyler, TX: Institute for Christian Economics, 1986), pp. 242, 255. One of the most important and most misunderstood of all Biblical declarations concerning the law is our Lord's declaration in the Sermon on the Mount: Think not that I am come to destroy the law, or the prophets: I am not come to destroy, but to fulfil. For verily I say unto you, Till heaven and earth pass, one jot or one tittle shall in no wise pass from the law, till all be fulfilled (Matt. 5:17,18). Two different words are used for the idea of fulfillment. The word translated as "fulfil" in verse 17 is plerosai, related pleroma; it means to make full, to the top, to fill, diffuse, to cause to abound, to pervade. Christians are said to be plervusthai, filled with the power of the Holy Spirit (Col. 2:10; Eph. 3:19). Christ "fills" the universe with His power and activity (Eph. 4:10, pleroun). The word means to fill and to keep full, i.e., to put into force as a continuous thing. Thus, our Lord declared that He had come to put the law into force and to keep it in force. . . Christ as the Messiah or King, because He has come, declared afresh the validity of the law and His purpose to put it into force. R.J. Rushdoony, The Institutes of Biblical Law (Nutley, NJ: Craig Press, 1973), p. 698. Theonomy is doing the word of God. The Love of God and of neighbor is the summary of the law and prophets. Doing the word is theonomy. Then out of them shall proceed thanksgiving And the voice of those who make merry; I will multiply them, and they shall not diminish; I will also glorify them, and they shall not be small. Offer a sacrifice of thanksgiving with leaven, Proclaim and announce the freewill offerings; For this you love, You children of Israel! Says the Lord GOD. But I will sacrifice to You With the voice of thanksgiving; I will pay what I have vowed. Salvation is of the LORD." For all things are for your sakes, that grace, having spread through the many, may cause thanksgiving to abound to the glory of God.